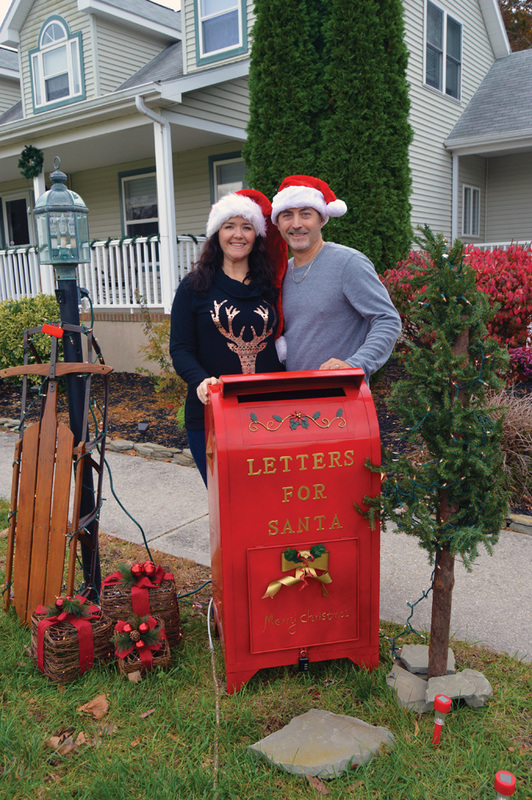 Sean and Kristina Malone have set up a mailbox for Santa and responds to every letter. The mailbox is located at 2 Windward Way in the Cripple Creek Golf & Country Club in Dagsboro. When Sean Malone of Dagsboro worked for the U.S. Postal Service, he took on a side gig as Santa’s helper. “I just happened to come in one day and we were starting to collect Santa letters, and the person that was always answering the letters had left,” he said. “They weren’t sure what to do with the letters, so I volunteered that I would take the letters over and I would answer them. “So I did that in Millsboro and Lewes and Rehoboth,” he said. And he answered every letter — by hand. Malone said some of the letters contained requests that tugged at his heart because they weren’t the expected pleas for Xboxes. So when Malone spotted a bright red “Santa’s Mailbox” in a store, he knew he had to bring it home. His wife, Kristina, said the mailbox was literally the answer to prayers, as they had been feeling that they wanted to do something to help their community but hadn’t settled on exactly what. “We’ve been thinking and praying, and we want to do more,” she said. “We don’t have a whole lot, but we know we have enough to help. “So when he saw that mailbox, he was like, ‘Honey, I’m getting this mailbox. We’re putting it out front. Maybe kids and families will start to put letters in there, and we can write them back, just like I did in the post office,” she recalled. They set the mailbox up in front of their home in The Greens at Cripple Creek. They also posted a photo and a short description of their project on local Facebook pages. That was Saturday, Nov. 10. The couple also set up a GoFundMe page to raise funds so they can help local families who express needs in their letters. As of Friday, Nov. 16, $425 had been donated to the fundraising page. Kristina Malone said people have asked them why they would take the chance of opening up their home, by putting their address out in the media. “With all of the sadness and devastation and harm and hurt and tragedy that’s going on in the world, I feel like this is a way to show that people can still be trusted,” she said. “There’s a lot of hope; there’s a lot of love; and there’s a lot of good people in the world — not just us, but families coming to our home. “I feel like this is very personal, and it’s very heartwarming,” she said. “We’ve had a rough year this year, with losing a business, and we had an animal tragedy, and we have parents that are going through health issues, and it’s bringing us down a little — so this is something to just really bring us back up and give us some good to do. The Malones have already helped a local family who expressed a need for beds for their children through their Santa letter. They happened to know of beds that someone was selling, so they bought them and saw that they reached the family. Kristina Malone emphasized that adults are welcome to write letters, as well as children — there’s no age limit on Christmas magic. She also said that if adults add contact information, such as an email address or phone number, to their child’s letter, it helps them to better know how to respond. 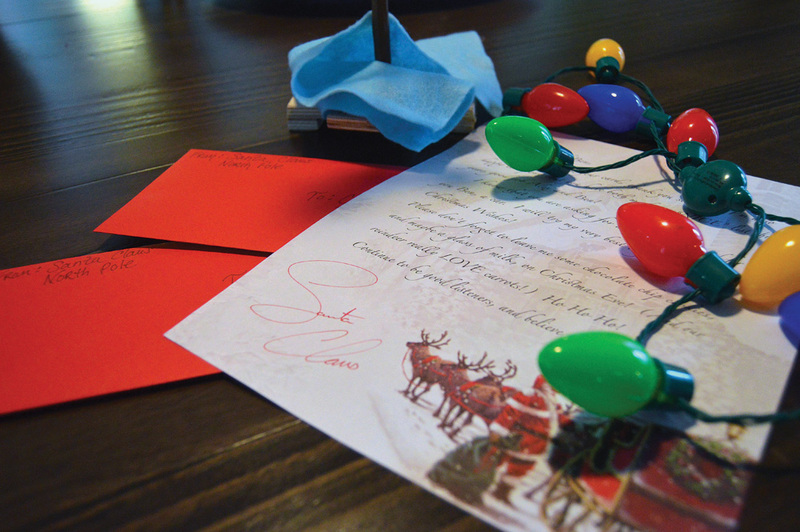 Each letter to Santa gets a personalized response on fancy paper, in a red, hand-glittered, scented envelope. She said they try to include a small “treasure,” such as stickers, in each response. As an example of the effort that goes into the letters, Sean Malone recalled one letter from a little boy that had gotten wet and was unreadable. But the return address was legible, so he went to the boy’s home to see if he could learn what the boy had written. The boy’s father answered the door. Through talking to the dad, Malone learned that the boy had asked for a kitten, but that he had been told a kitten wasn’t in the cards, since they already have a cat. So Malone left with good insight on how to answer the boy’s letter, as well as his current cat’s name to include in their creative response. The whole Malone family is involved in the Santa’s Letters project, including 12-year-old son Jackson, who is the “dedicated postmaster” who checks for letters and helps where he can, and their pet cockatiel, Pepper, who is “the deliverer of the letters to the North Pole” — via “Air Mail,” perhaps? The Malones are planning to open their home even more to the Christmas spirit by hosting a “meet-and-greet” with “Santa Claus and Mrs. Claus” at their home on Wednesday, Dec. 12. The event will be held in their yard, complete with a bonfire, hot chocolate and s’mores, Kristina Malone said. Children (and adults) are welcome to bring their letters to Santa at that time. As for the future of the Santa’s Letter project, the Malones said they will see how it goes this year, but that they hope the joy that it brings will go beyond the Christmas season. They said they hope to be able to help more families through donations to the GoFundMe page. “Santa’s Mailbox” is located at 2 Windward Way, Dagsboro, DE 19939. Anyone who is unable to personally drop their letter in the mailbox is welcome to mail it to that address, and the Malones will make sure the letter reaches its destination. The fundraising webpage is at www.gofundme.com/santasletters. The Malones can also be reached by email at kai51479@gmail.com or by phone at (215) 880-2506. The Santa’s Letters project is on Facebook and Facebook Messenger, and can be found by searching for @santasletterscharity. The “meet-and-greet” at Santa’s Mailbox is scheduled for 5 to 7 p.m. on Wednesday, Dec. 12, at 2 Windward Way, Dagsboro. There will also be a collection for Toys for Tots during the event.